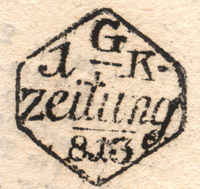 The Austrian government was perennially short of money, and between 1 July 1789 & 31 Dec 1899 they instituted various systems of levying a tax on newspapers and magazines. 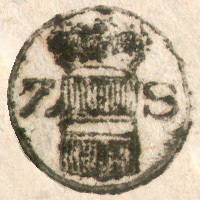 Initially, payment of the tax was shown by a "signet" imprinted by hand or as part of the printing process. The 1789-1791 version is extremely rare; between 1792 and 1803 the tax was in abeyance. 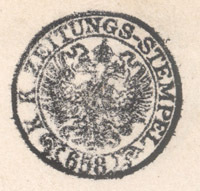 In 1803 the tax was reimposed, and from then till 1854 the signet's design was changed annually (this is 1813, 1 Kr value, used at Graz). The tax on foreign newspapers was usually twice that on inland newspapers; however, newspapers from certain countries ordered by advance subscription through the Post Office were taxed at the inland rate (which at times eg 1851-1857 was zero). Although this was a revenue tax, much of the detail was handled by the Post Office. From 1 March 1853, adhesives were introduced as an alternative way of paying the tax. There were 4 issues: "arms in frame" designs in 1853, 1858/9, and 1877, and a "medallion" design in 1890. 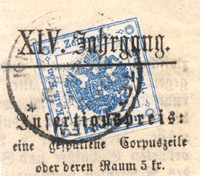 These adhesives are found cancelled by a wide variety of Post-, Tax- and Customs-office cancels; but were often applied to the newspaper sheet before printing so as to be "cancelled" by the print (and in this example by a tax office canceller as well). A 25 Kr perforated adhesive was introduced in 1890, to facilitate paying the tax on a weekly journal bound into a half-yearly volume. The signets were withdrawn in 1854, but when on 1 Jan 1858 the inland tax was reintroduced, a new design of signet appeared, having a coat-of-arms and the serial number of the stamping die in a single circle; this design was not changed from year to year. From 1881, a change in the rules meant that a newspaper printed in multiple sections, or a bundle of separate newspapers posted in one wrapper, had the tax levied on each item instead of once per package. 3- and 4-fold signetting, and multiple use of adhesives, are found. 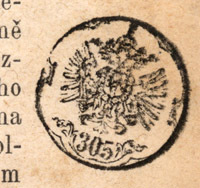 In 1885 a new design of signet appeared, double-circle, with arms, inscription, and the stamping die serial number. The Newspaper Tax was finally abolished on 1 Jan 1900.